Chop or Die, But Do Vote! Chopping has come up in a couple of conversations with women friends lately. Yes, chopping, not shopping, thank you. Since I am who[sic] I am, sometimes a word or an image repeated, even in completely different contexts, lights up some mysterious part of my brain. I got to thinking. The friends in question and I are all artists/artisans. One friend mentioned that after working at a computer for an extended period of time, she needs to go into the kitchen and chop vegetables. Another friend had her work with a cutting tool admonished as being “choppy”, not to mention unbecoming her gender. What? I thought about how I enjoy a job that requires getting out my bamboo froe. More about that later. In my view, the act of chopping means taking an edged tool in hand and inviting a certain blend of speed, momentum, and larger muscle groups to augment an already practiced partnership between the hand and the eye. For instance, tonight’s butternut squash was bisected with one formidable whack. Had I not spent much of the day fine-fitting a ridiculously little piece of wood, I may have been happy to simply lean into the vegetable with my biggest knife, rocking with it until the blade hit cutting board. That squash got whacked and it felt gooood! Now this post, begun in all innocence, is about to take a timely turn. Next Tuesday, we here, in the States, exercise our civic duty to stand behind the candidates of our choice. This is a privilege and, in my view, an obligation of the highest order. I have never missed an opportunity to vote. I consider myself a humanist, sometimes even an optimist. That said, I recognize my not-so-inner curmudgeon. People are basically self- interested and short-sighted jerks. I have been closing my ears against the barrage of measured lies and twisted truths. Unfortunately, there’s not a heck of a lot else to listen to. So I find myself trolling the neighborhood for places to be on Tuesday night, where I might drink with abandon in case this election heads for the crapper. The alternate title to this post was “Chopping Therapy 101”, which may help explain why this election digression is not totally a non sequitur. If I were still heating with wood, you can be sure I would be out there with my maul and axe reacquainting myself with my right-side rotator cuff. Instead, I chop vegetables. I use the biggest knife I have. I fit little pieces of wood all day and then split out a bunch of end blocks and bass bars. Whack! 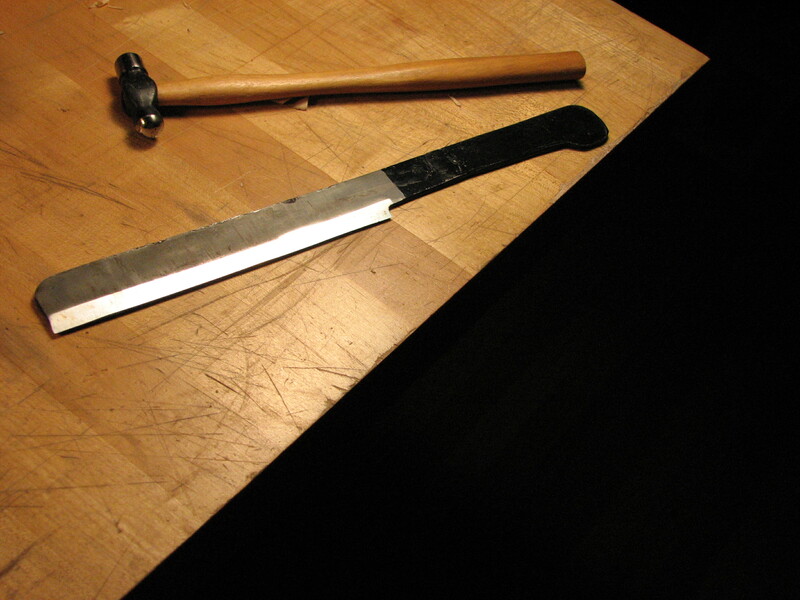 Here is the aforementioned bamboo froe: It’s a Japanese tool that is used for splitting bamboo. Someday, perhaps I will understand where it figures in terms of Japanese craft and construction. It fits nicely in my hand, with a comfortable balance and confidence-inspiring heft. 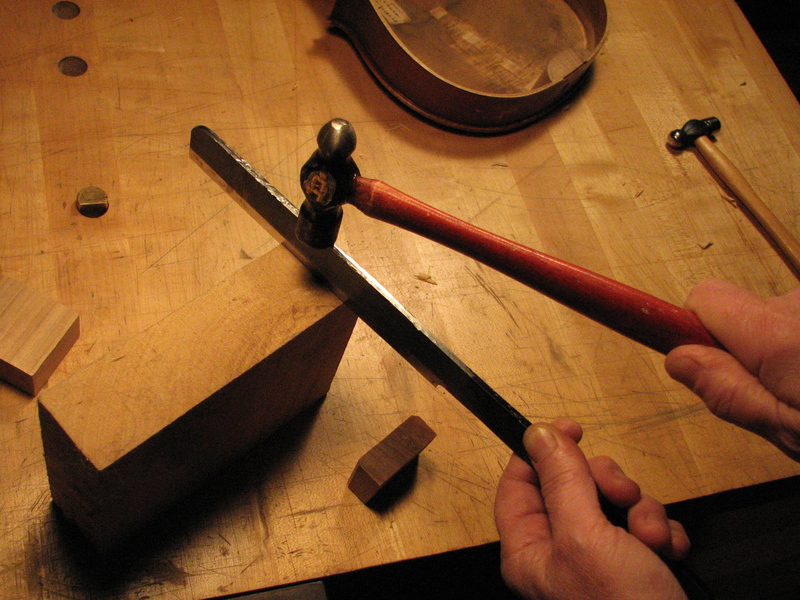 For me, it’s the tool I turn to when I need to be assured that the grain direction in a given piece of wood is appropriate to the purposes to which I am employing it. I use it to split out bass bar stock and also endblocks. I pick up a small hammer, position my froe, and give it a whack. The split follows the grain line. There is no deception here. Chopping exposes the nature of a material, the propensity of the tool and perhaps the mindset of the chopper. It’s an activity that employs a kind of controlled abandon, or calculated wrecklessness. The perfect antidote to a day filled with the questionable minutiae of modern life.